In the debate of the best racers on the iPhone platform, titles such as Real Racing and Need for Speed: Undercover are likely to come up. 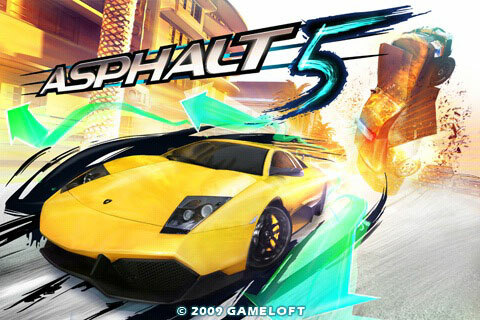 You may want to add one more to the debate — Gameloft’s newly released Asphalt 5 is simply an adrenaline rush in your pocket. On the fun meter, Asphalt 5 definitely delivers with strong sense of speed. But, while the game delivers a solid overall racing experience with a good amount of content and responsive controls, the graphics and animation do keep it a notch below the others. On that note, the first thing that hits you is the graphics. Even though they may not be the smoothest (on a 2G iPod) on the platform, they do pop off the screen, which makes a difference when you’re careening through tracks and dealing with oncoming traffic from all sides. Framerate aside, even though you may not be focused on the details, Gameloft obviously has. Whether racing through snow-covered freeways, mud soaked roads, or the darkness of night, the details are everywhere. From the signs on storefronts to damage on vehicles, Gameloft has definitely spent a good deal of development creating an arcade experience with good degree of visuals. The perky soundtrack is a keeper, although you can play your own music if you’re into something a little more gut wrenching. The objective of Asphalt 5 is simple: win races and earn money to soup up your ride. Of course, you’ll face a variety of obstacles including oncoming traffic, innocent bystanders, and police in addition to varying weather conditions such as snow and rain. This can all be experienced through 3 different camera angles: close, far and bumper. Bumper provides a driver’s seat view which can be quite intense with every bump and crash. The game takes you through 12 different locations including Aspen, St. Tropez, Athens and Las Vegas. The well-designed tracks offer different terrains and environmental conditions, and most importantly, shortcuts. These shortcuts, which can be seen on the mini-map, are a good addition allowing players the option of sticking to the standard track or risking it by taking a shorter yet tighter path. In some cases, these shortcuts are the only way to succeed especially in the time-sensitive races. Asphalt 5 has three game modes: Single Race, Career and Local/Online Multiplayer. For many, Single Race will be the first taste of Asphalt 5 which provides a quick multi-lap race through the track of your choosing. While Single Race provides a good setting to practice driving skills, winning doesn’t unlock new tracks or earn money. 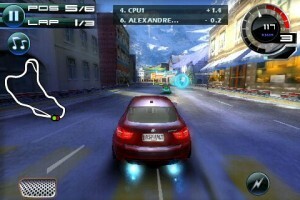 Online multiplayer provides a number of options which includes competing against up to six players in a single race. In our brief time with the game, the online experience was smooth with minimal performance issues, and joining or hosting a race is relatively easy. Meanwhile, Career is the guts of Asphalt 5, and where winning matters. Whether unlocking tracks, picking up women, or earning money, Career is where you do it facing 8 different racing events. And once tracks are unlocked in Career, they become available in Single Race. With a variety of challenging racing events (time trial, cop chase, escape, drift and more), Asphalt 5 has 33 licensed cars and motorcycles potentially at your disposal. From Lamborghinis and Ferraris to Ducatis and Kawasakis, winning races and earning cash will give you access to many of these vehicles for a price. The default vehicles are the Mini Cooper S and Nissan 370Z, and all vehicles are stored in the Garage section. 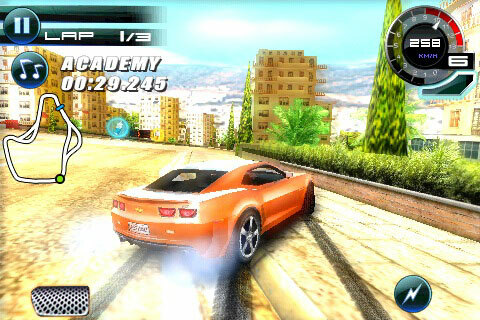 If you want to cut through all that, playing online through Gameloft Live will provide full access to all the vehicles for competing against others or in individual time trials. Cash can be used to upgrade vehicles in three areas: engine, handling and boost. And you’ll find there are numerous other ways to customize your vehicle. For example, paint jobs can be altered using the color slider and decals can be applied. Earning cash goes beyond winning races although that’s a big part of it. Cash is also earned by collecting tokens on the roadway, near misses with other vehicles, drifting, jumping, and eliminations. Asphalt 5 provides a responsive set of controls, and in general, the handling is highly accurate. The game consists of three types of controls: wheel, screen tap, and accelerometer. Choosing the accelerometer controls allows you to turn on/off auto acceleration. Of the three, the accelerometer feels the most natural with screen tapping the most awkward. With auto acceleration turned off, a brake pad appears, although I rarely used my brakes except when wanting score style points for drifting. When it comes to gameplay, Asphalt 5 does what it’s supposed to do—provide a good sense of speed. The different race types certainly offer variety, and a replay function is included at the end of each race to review the race, although replays can’t be saved. The AI in Asphalt 5 feels well balanced providing enough aggressive driving to keep it interesting but not overdoing it either to make it impossible. The controls make steering and handling relatively easy, and most won’t have issues picking them up. The game is fairly forgiving when it comes to crashing into objects, however, crashing into oncoming traffic tends to have more severe consequences by stalling your momentum and losing position in the race. Overall, Asphalt 5 definitely delivers on the fun meter. The controls and content really makes this a racer accessible to everyone. Aside from the middling (though acceptable) framerate on earlier generation devices, Asphalt 5 is solid arcade racer with quality graphics. With a variety of different races, a relatively balanced AI, online multiplayer and a great feeling of speed, Asphalt 5 comes highly recommended. Previous PostPrevious ‘Command & Conquer Red Alert’ – Thanks a lot, Einstein!